This entry was posted in Environment, Global warming, Guest Post, Politics on January 21, 2019 by Lambert Strether. 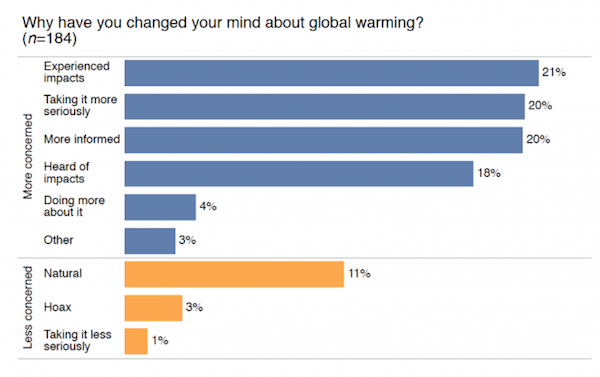 It’s not about climate; most people agree that it’s important to do something. Where it all goes wrong, is in what to do, and especially, who’s going to pay for it. As long as elitists are talking down on the average person, and refuse to provide a good example, people will be very skeptical. Currently, in The Netherlands, there’s a lot of discussion about the so called climate plan, which simply dumps a lot of costs on the average citizen, while other parties, that have a much larger impact, like agriculture and industry, don’t take a hit. Yeah, that’s really going to work. Who will be left to argue about fair distribution of effort and cost after we are extinct? Whoever can, should. Whoever can, should -> Whoever can combat climate change, should. Adding…, generally, that means Nation States and giant corporations (including fossil fuel). EVERYBODY SHOULD combat climate change, although some must do more. We have to distinguish between awareness on climate change, and awareness on the kind, size, and scale of measures needed. There is where the problem lies. I certainly hope I didn’t say, “not me.” Government policy (renewables, etc. ), and corporations, such as utilities, I believe, will initially get the biggest bang for the buck (low hanging fruit) and frankly without that we are doomed, but government can and must also set policy so that the public at large is made acutely aware of the problem (taught about it) as well as guidelines for them to follow, such as home energy conservation requirements for those who have houses or own apartments and how to access subsidies on the residential and individual level. As Yves says, conservation of energy is where it’s at. Personally, I think clear policy and mandates will have a considerably greater result from the population as a whole than ad-hoc efforts by individuals who are often not really aware of what they can or should do. I would rather work with people constructively than judge them by snippets of their opinion. I’ve taken HERS (Home Energy Rating System) classes to learn how to assess the thermal envelopes of residential buildings, where and by how much they fail, and how to get the biggest result for a given effort and feel it is where the most important conservation of energy is at – but it is also complex. While my life took other turns before I could put that into great practice, I have some understanding of the difficulty involved. Without some expertise (or at a minimum knowledge of the construction industry) one can waste considerable sums of money without getting much in return either in terms of satisfaction or in doing one’s part in energy conservation. Government should encourage facilitate, organize, subsidize and where necessary mandate such efforts (and make HERS like programs freely available to all) so that it is affordable and so that there is coherence and concrete results. It’s grand to say it’s up to everyone, and no effort is too small, but there is a science behind it and that should be made available to everyone lest such zeal is wasted in good intentions. Let me tell you that I applaud your effort. I am in continous learning mode in exactly the same issues. As you say it is complex and it is quite difficult to find the best solutions, there are contradictory effects of various possible measures, and we have to account for economic criteria, energy saving criteria, life cycle analysis and results in quality and confort. It is you, me, architects, engineers, governments etc we are all in the process of learning what to do and finding ways to do it better. An example that is occuring now in Spain is that the most recent building code (from 2013 that changed the “new” code approved in 2007) and stablishes more stringent characteristics in the thermal envelope of residential building results in new ventilation necesities. Newest residential buildings are so well thermally isolated that do not “breath” unlike older buildings. Thus, active ventilation is required and it has a cost in energy terms. So, the next building code which is likely to be approved in 2019 will include requirements in ventilation absent in previous versions. As you can see, 3 different building codes in few years indicate a rush to deal with the problem. This is in my opinion a good example on unexpected challenges we find in our rush to reduce CO2 emissions. I live in an apartment in a 16-storey building. There are other fourteen apartments just like mine (same orientation, same space…). Because there are digital counters in a room I can see how much energy we consume. The counters display the consumption in kwh during the last 365 days. Is there room for my neighbours to do something about climate change? For sure! Is there anything Ignacio can do about climate change? For sure! Is there anything that average americans can do about climate change? For sure! Being curious about these things, I’ve looked at my apartment buildings power meters too – there is a vast difference in power use between nearly identical apartments in my block, sometimes by a factor of 4 or 5. Some have a good reason – they have children, or some apartments sublet to multiple young adults, but in plenty of cases some people just seem to have the heating on all the time and run lots of hot water and keep the lights on all the time. I was surprised to see I was the lowest user in my block, despite being just moderately stingy about these things. This is the frustrating thing – there is lots of ‘low hanging fruit’ that could take a very significant chunk of emissions very quickly. But people lack awareness of their own emissions. As you say above, even ‘aware’ people seem to want to pass the blame – its the Chinese, or the Americans, or billionairs, or capitalists, or whatever. Its not. Its us. Your observations and mine go in the same direction. I didn’ say but we are four adults living in my house (two of them very young universitarians), which is almost certainly above the average in my building. Besides those comparisons in my building I have a “maximeter” –made in UK the brand is “Efergy”– that I am using to study the energy consumption profile of my friends and then give them free advice on how to reduce it. One after the other I am always surprised on how much they consume, typically more than twice than my 2100 kwh/year. My conclusion is that we became used to unlimited electricity supply and acted consequently in the past. This means that we bougth appliances, apparatuses, ligth points etc without thinking of the “externalities” of energy consumption. For instance, in Madrid lots of people bougth, besides a washing machine, drier machines which are completely unnecesary in the dry climate prevalent in the city. I would forbid such kind of appliances for residential use in Madrid. What a waste of energy just because I want my suit ready, pronto! It would be curious to see what would happen if electricity was rationed so that each person got only so many kwh of power per day. I would say that you would have little problem adapting but your neighbours might. Thing is, everywhere I look I see power being used for stuff that does not need to be. Street signs that could be just standard metal warning signs are using up power. Returning books used to be just a matter of dropping it into a chute but now has powered system with software applications and wifi & bluetooth for all I know. It’s nuts but that is our culture – use more and more power so that if anything happens it all falls down. Volcanic activity must stop Immediately or suffer the consequences of taxation per eruption! Oh yes, there is our own yellow vest moment coming up. is it actually possible to concoct any kind of climate change plan that has no effect on the average citizen? Even in high consumption nations? I mean there is dumping disproportionate costs on the poor etc. and that’s a problem. And many problems are best solved socially (like lame example but say ban plastic bags, don’t just expect people to all use reusable bags just because). But I don’t think the NO impact on the average citizen stuff is possible, so are people just getting more and more delusional these days? It is all about fairness and effectiveness. If you come up with plans and measures which are widely criticized by experts, and cost you a lot of money for some fictional gain, then people will be critical. Currently, lots of people in The Netherlands simply feel that all the climate change news is being used to crank up taxes. If you want people to do something, use positive incentives. We already do quite a lot when it comes to waste and separating waste for instance, and people don’t complain about putting in some effort. But politicians are idiots, by increasing the price of public transport (which causes more people to use a car), not solving the problems with housing (so people cannot live near their place of work), putting lots of fixed costs and taxes on energy (so being efficient with energy doesn’t pay). Some measures, like subsidies on hybrid/electric cars also backfire, because it effectively subsidizes more expensive cars (Teslas are relatively expensive, and lets not talk about the abomination which is the Mitsubishi Outlander Hybrid), whereas the average citizen indirectly pays for the subsidies. There should be an honest discussion about what measures can be taken, how much they cost, and how effective they are. That’s not what’s happening now. If global dewarming supporters engineer for their own personal selves a smaller-carbon-footprint lifestyle which they can prove is smaller carbon footprinty, they will gain the personal credibility needed to be taken seriously in such discussions. Seriously enough to at least be given a respectful hearing. And that is the constructive difference which personally visible personal conservation lifestyle engineering CAN make in the sphere of slow steady mind-shifting. One of the buzz points I encountered (in an on line conversation with an individual with strong right wing views) was the opinion -expressed as fact- of a so called expert who claims that there is much greater disagreement between climate scientists than publicly broadcast. This catches the, “It [disagreement among scientists] has to be true because they [news, media] don’t talk about it,” drift that’s been going around -often with good reason- since the anything bad Russia Russia! scandal where the media is indeed silent on all the contradictory facts that strongly suggest the whole thing was a fake. But regardless of the merits of the origin (the media is silent on so many things that the silence alone can be considered substantiating), It forms a kind of self reinforcing lock on one’s opinion and unfortunately, I think similar issues of perception such as political bias, pointed out in this article, affect people across the political spectrum. That is, my take away from that lengthy exchange, was to realize that I’m more subject to bias than I would have otherwise assumed. Nevertheless, with minimal on-line inquiry, I found out the individual in question, the so called expert claiming disagreement between scientists, was essentially a shill, paid by oil corporations directly to go around spreading his screed. And there are others like him, who make there living the same way. When I pointed this out to my right wing interlocutor with several substantiating links, I got no response. Again, a locked opinion -hence my introspection- I wasn’t about to change with any lofty argument no matter it’s high probability of factual basis. The other more painful takeaway from that exchange was that one needs to be somewhat of an expert, or at least far more knowledgeable than I, to make compelling arguments on a given subject. Thomas Neuburger, as Gaius had a great article on NC some time ago in which he pointed out that it would take some major event such as Miami going underwater to really shake up people’s baked in perceptions on the subject and I strongly suspect that the violent storms of 2017 and 2018, not to mention the fires in California, have had just such an effect – but what a price. I think what you fail to realize that there are clearly two distinct camps of the science community: theoretical science and applied science. I have no doubt that the theoretical scientists probably do have a 97% consensus with respect to the theory that an increase in atmospheric CO2 causes global warming and a decline in it will cause global cooling. But I doubt the scientists who are in the applied sciences, if polled, would also poll in anything remotely similar. Applied scientists who tend to base their opinions on their experience, might disagree with the proposition by 97%. It would not surprise me. I doubt they have ever been polled. Moreover a corollary critical question would be how does one qualify to be a scientist so that one can be polled? And I think the answer to that question by the theoretical scientists who do most of the publications, has been that applied scientists are not real scientists whose opinions can be taken seriously and so their opinions don’t count and should not be polled. And then there is the issue of financial bias, which seems to be the primary way both camps attack each other. What applied scientists (who usually fall in the skeptic camp) often claim that the theoretical scientists are biased because they have to live off the largess of governments and universities. The theoretical scientists would say that applied scientists are biased because they get their funding primarily from large corporations. What you did with your argument was discount the opinion of someone who depends on corporations for a livelihood and never considered that those whom you call experts get their funding from governments and universities. It is economic bias either way. And economic bias is not a particularly good basis on which to determine which scientific expert is right or which one is wrong. There is an exception to the theoretical science community. Nobel prize winners. About half reject the mainstream theoretical view of CO2 causing global warming. Half. No — it is not symmetric. A corporate economic bias has a clear direction — profits. A government economic bias in almost non-directional, it’s driven by the community consensus. It’s greatest weakness is group-think. There’s an objective difference to the two. Disagreement on even fundamental things is something you see when you get deep into a science. But the bases of those disagreements are almost impossible to explain outside of your community — it’s often subtle but important issues that take many years or decades to develop the necessary background to understand. So yeah, that’s what it’s going to look like from the outside. There’s a strong consensus at the “write a textbook” level — but inside every paragraph, when you read the papers, the consensus breaks down and everybody thinks everybody else is an idiot. You even see this cross-scientific communities: everyone in my field (but me) is an idiot, but people in other fields really know what they’re doing. What you going to do? That’s the nature of knowledge. But we have to work from the textbooks, not from the inside baseball. What a price? Well, if that’s the price of progress, that’s the price we will have to pay to progress. Humans, most of them, filter non-immediate existential threats. As climate change speeds up and becomes more immediate, like the examples in the text of warmer winters and more violent storms, more people stop filtering it. I’ve always suspected that once climate change denial became untenable, the Anglosphere right wing (where the denial largely originates, conservatives in most other countries don’t seem to have the same problem with the scence) would move on to different memes, i.e. ‘its too late to do anything about it’, or ‘you can’t tell human caused climate change from man-made climate change’ and ‘this is just an excuse for taxes on regular folks’ or ‘we need more nukes’. From a non-scientific trawl of BTL comments, I think we’ve just moved on to that second phase. 2) i won’t do anything until… China, because you know, its non-sensical. From denial to excuses. When everybody is responsible — though some much more than others– nobody is accountable. Exactly and there are quite a few really good scientists who disagree. Half the Nobel Prize winners refused to sign a petition on climate change. Moreover there are some really prominent astrophysicists who believe that the solar wind has a huge effect on climate as does a decline in the ultraviolet during periods of low solar output. There are some really interesting theories about how the sun affects our climate much more than we thought. The most prominent solar physicist is Henrik Svensmark and his theory has been getting lots of attention and is quite despised by the IPCC. If you care here is a documentary about Henrik Svensmark and his theory. He is Danish and not a right wing Republican. Remember the crap about sunspots? Well if anyone had any smarts they would have known not to be so derogatory. Sunspots are a proxy for low solar magnetism and low solar magnetism is what drives the solar winds. Watch this documentary if you have an open mind. About retirees being the group that most shifted their opinion on climate change, I have a theory here. I have noticed over the years that whenever there is a natural disaster, that when the newies come around to interview the survivors, a lot of the time it is older people that are the ones being interviewed. A lot of the people killed in the recent Californian fires were also older people as well. If my impression is true, then I bet that a lot of older people watching the news in America are also noticing it and maybe realizing that it is people in their age group that are most in the firing line. Just a theory but one that might answer this development. If you’re old enough, accepting that climate change is happening knowing you’ve only got a few decades left on this good orb, isn’t that big of a leap of fade. We’re not really in the firing line, it’s the 25 year old with 50 years in front of them, that will bear the load. The wildfires cut to the quick and whilst the flames threaten, it’s in our faces, but what would really shake up the state is a drought of a duration beyond our technological ability to counter it. We were so close to the breaking point, when saved by an onslaught of water falling from the heavens in 2016-17, but w/o that deluge, we’d be in deep doo-doo, as the follow-up winters have been no great shakes, last January being so warm that wags in Tahoe started calling it Juneuary. I think with us old folk (speaking for myself at 72) it might also be part of the Merl Haggart syndrome. After he turned 60 he admitted without affectation in an interview that he no longer liked the things he used to like. That part of him had vanished. He was matter-of-fact about it. And I thought, Well, yes, I know that feeling. So it’s like at 65 we’ve got nothing to pretend about any more. If you’re gonna convince yourself that global warming and climate change don’t exist you’ve gotta have something existential to protect. Not to get too heavy here. Because I’m still an optimist and I’m a meliorist too, I’m just not suffering from my silly delusions as much as I used to. The most ego-committed denialists still tend to be those who will be dead before the worst hits, and the pro and semi-pro propagandists who feed their death cult tend to be (far) over 40 as well. However, they do seem to be running on fumes now. The raging BS of the prior 2-3 decades is pretty stale, and its most ardent salesmen are flagging. I hope so. There’s no reason to obstruct survival. For conservatives? Maybe show them the clip of Obama bragging recently about how much he increased oil production during his presidency? Conservatives know (much more so than libruls) that Obama’s a slippery politician. If Obama’s for it, they may be inclined to go against it. More broadly, a lot of conservatives think liberal pols are just full of it when they say they want to help the poor or make society better. They’re often right. Make the point that in typical Obama fashion, he’s supposed to be pro-environment but actually ramped up oil production and that team dem just likes to talk about climate change and refuses to DO anything about it. Go on to comment how uncomfortable AOC made Pelosi on the issue. I’ve always wondered about how much this drives the psychology of climate-change deniers. Liberal politicians don’t *act* as if the end of the world is coming, so a lot of people infer from their actions that they don’t believe it. That inference is wrong — it’s enough if they just don’t care, regardless of what they believe. Paris accords were weak tea — it only makes people doubt the sincerity of those who constructed it. How much should US give up if the effect on total bad stuff will not be measurable? The US should be taking the lead on global warming. Our historical contribution to atmospheric greenhouse gases is the largest. A Green New Deal in the US would lead to other countries following suit, by showing we were serious about addressing what otherwise will be a global catastrophe within less than 2 generations. If the IPCC is correct, we have 10-15 years before something really big–a giant methane release from the Arctic, perhaps–is a too-late wake-up call. End-stage capitalism is on the verge of ending “advanced” stage civilization. We can continue with business as usual, and watch a race between nuclear armageddon and climate catastrophe unfold before us, or we can mobilize to demand we begin to make the very significant commitments to remake our society in a sustainable, steady-state, fashion. …with his opposing number in Beijing whose family fortunes went from being bicyclists in the Tour de China as everyday transport, to being as eager as I was to get my driver’s license when I was 15 & 1/2? I teach, among other courses, State and Local Government and US Government at a local 2 year college. As part of both, because it is a huge issue both here in coastal Massachusetts and across the nation, I do a class on anthropogenic climate change. It’s largely a lecture but also with some discussion. – The classes are something of a demographic cross section of this region, Southeastern MA; what’s curious about this neck of the woods that is different from much of the nation is that you have Trump precincts right on top of Clinton precincts; the geographical sorting of other places has not really occurred here. – Thus, I was surprised by the overwhelming acceptance of the facts of climate change. – Part of this is generational. Gen Z (early 20s and younger) have never lived in a world without war, mass shootings, or climate disasters. They recognize the reality. – Part of it is sitz im leben as the German scholars put it, “situation-in-life.” Parents — and many of the students are parents or caretakers of children — recognize the dire realities we and esp. their kids face. – Part of it is regional. We have seriously bizarre winters these days. It’s 4F (-15.5C) today. A month ago, on the winter solstice, it was 61F! A recent Christmas Day was in the 70s (F). This is unheard of in coastal New England. Some winters have no snow, some 120 inches of snow. Nor’easters now occur well into June and July. Things are weird. – Part of it is class-based. In my experience, having both taught at and attended competitive four year institutions, the class basis (bourgeois and upper class) of these latter is actually more congenial to deniers, who are often well-to-do. You get College Republicans, people able to access “Reason” [sic] and other right-wing journals, people who were big fans of the Weekly Standard, etc. These well-heeled deniers are simply absent among the majority working class students I teach. To the extent they have any time to engage with politics, incl. climate politics, they want to ameliorate things (cf. Lambert above). What you don’t have is the godawful contrarian college newspaper columnist types who go on to become the Jonathan Chaits of the world. – I also point out small, practical things can be done right now. We can plant trees. We stop ripping up trees. We can restore fallow cranberry bogs to Atlantic white cedar swamps that soak up a huge amount of carbon in all that peat. Melioration is possible. Ultimately, and very quickly, we have to get off carbon — but it’s not necessarily rocket science to make things better _right_now_. Gardens and plants are intuitive and well-beloved by most humans. – I also point out, pace the yellow vests, that the burden, in my view, ought to fall mostly on those who put out the most carbon, i.e., the top 10%. This is assented to as commonsensical and fair. – So overall, I’ve been pleasantly surprised. Sure, there are likely some deniers out there who won’t speak up. There are also some Pepe the Frog dudes judging by their bumper stickers. But they strike me as a small, very small, minority, maybe 1 in 20 at most. So I’m cautiously … well, not optimistic, but melioristic. Just wanted to drop a few notes from the front-lines. > It’s 4F (-15.5C) today. A month ago, on the winter solstice, it was 61F! A recent Christmas Day was in the 70s (F). This is unheard of in coastal New England. Some winters have no snow, some 120 inches of snow. Haha (kind of a bitter “haha”, to be sure) this is where the conservatroids bleeped themselves. They made the big effort to rename it from “Global Warming” to “Climate Change”, and because of that everybody understands that bitter cold can also be a symptom. It’s the wackiness, not the absolute temperature in any particular spot that we can observe directly. Frank Luntz, wasn’t it, who’s responsible for that backfiring piece of agitprop? Of course the bougies are more congenial to denial — it’s a personal cost to them. What we have been doing for the last 300 years – what sustains the lives of billions of people – is drawing down nature’s capital of “ancient sunlight” accumulated over hundreds of millions of years. So yes, we need to curb our emissions. But we need to go beyond that and ask how complete a victory over other forms of life in the “struggle for energy” we really want to achieve. Fossil fuels – “ancient sunlight” – are not going away any time soon. If you really believe there is a ‘right to life’, not just for yourself but for your posterity, it is past time to stop debating the reality of climate change. If you still have doubts, go outside on a hot summer day and hold your hand on a black (as in carbon) surface. It is past time to come to the realization that “natural energy” is as Soddy put it perhaps the “key ingredient” of wealth; that we have no right to squander ‘nature’s capital’ on wars, Great Games and conspicuous consumption; that we have an obligation to future generations to pay the full costs of its use. We live in the Quaternary Period which began about 2.5 million years ago. It is sometimes called the Quaternary Ice Age due to the fact that the earth’s southern pole is permanently covered by ice and more significantly, because the Northern Hemisphere experiences cycles of glacial advance and retreat. Over the past 7 to 8 hundred thousand years, according to the analysis of ice cores from the antarctic, the periods of glaciation have tended to last about 100,000 years, while the duration of warmer inter-glacial periods average about 10,000 years. The current inter-glacial, known as the Holocene, began about 12,000 years ago, and according to the ice core record would appear to be a bit long in the tooth. If the Holocene were like previous warm periods, the next glacial advance is overdue. Recent analysis indicates that the concentrations of CO2 and CH4 in previous warm periods were trending downward at this point. But during the Holocene these levels began trending upward starting about 5,000 years ago, approximately at the point when widespread agriculture began to be practiced – for the first time ever in earth history. The slow increase in concentration of these two greenhouse gases continued into the industrial revolution where they began to take off exponentially. All this leads me to hope that human activity has serendipitously averted the next glacial advance, and perhaps ended the Quaternary Period. As bad as the thought of 10 to 30 meters of water sitting atop Manhattan sounds, presenting enormous challenges of adaptation. The prospect of 1,000 to 3,000 meters of ice raises far greater challenges for survival. I don’t happen to believe that the nations of the world will succeed in averting Global Warming, but we or our descendants may look back on this point in history as one where we dodged a big frozen bullet. This is a perfect example of awareness on C.C. in search of excuses to do nothing. There are infinite possibilities you can imagine. So ignacio, what do you think about the next glacial advance? When is it due, and what affects will it have on our civilization? Do you simply choose to ignore it? Or do you regard it as fake news? Ignacio is tucked up in bed so I will reply. The next glaciation is due in thousands of years, and 1000 m of ice takes thousands of years to accumulate. Drowning half our cites and exterminating half our fellow species in the next one hundred years seems like overcompensation to me. If our civilization still exists after that I doubt they will thank us for our foresightedness. Thank you for your answer. Yes, why wonder about the next 1000 years when we have a challenge for the next 30? In geological terms we are in the midst of a spike in CO2/other greenhouse gases and temperatures and the size of this spike is almost certainly outside anything during the Quaternary and not “seen” in a few hundred million years. I bet we and our fellow living creatures of the “antropocene” don’t have much time to adapt genetically to such a change. So it is interesting to see, on behalf of human and non human creatures, if we can make this spike the shortest the better. The glaciers themselves will take thousands of years to form but the colder drier conditions causing them will establish themselves much more quickly than that. Your confidence that that these changes are much farther in the future and so can be ignored is not warranted. I admire your ability to predict the future on the basis of … well … don’t know, let’s call it selective adoption of scientific data. from the article – So do retirees just have more time to read the news or what? I realize that anecdotal evidence isn’t data, but in my experience – my mother, and one aunt and uncle have TVs that spend a good portion of the day on something calling itself a ‘News’ channel. And they are more closed-minded and ignorant for it. Her husband gets downright belligerent if you suggest that what is stated on the air is anything short of gospel. But even my mother has recently admitted there is climate change. Go back 3-4 years and she didn’t believe in it. A recent Monmouth poll found that 78 percent of Americans believe climate change is real and leading to sea-level rise and more extreme weather. That’s up from 70 percent three years ago. When the 0.1% can see clear profits, then our political class will suddenly become Climate Change Mitigation Enthusiasts. The way to sidestep the face-saving problem . . . . the “just admit you were wrong!” problem . . . is to drop the demand that global warming no-longer-deniers adMIT they were WRONG! Let them believe that they were right at that time with the information they had then, and they are right at this time with the new information they have now. Faces saved, minds changed. All the global warming realists have to give up is the pleasure of bragging rights over having been right all along and demanding to be recognized as such.